Don’t be bored this Christmas: watch these exciting new TV shows! Nothing says ‘Christmas’ quite like lolling about, munching Quality Street and watching TV. There’s been a quite a lot of controversy about this year’s Christmas TV offering, however. According to the Daily Mirror, 63% of the shows on the main 4 channels will be repeats. The horror! What else are we supposed to – spend time with our families?! Of course, that means 37% of TV this Christmas is brand new. And quite a lot of that new stuff actually looks pretty good! Here’s our pick of the new Christmas offerings to enjoy along with the endless repeats of Only Fools and your new DVDs (make some space and sell your unwanted ones here). This special edition of Charlie Brooker’s critically acclaimed drama explores what would happen if you could block people in real life, the effects of having a Google Glass dating assistant, and why you probably shouldn’t have yourself replicated so that your digital clone can serve you as an ultra-efficient PA. In short: it’s not traditional Christmas fare, and it’ll probably make you think twice about asking for a phone for Christmas too. But it does have Jon Hamm in it, so that alone will appeal to some. When is it on? It’s already been on. But you can watch it on 4oD throughout the Christmas period. There are plenty of Christmas episodes of beloved sitcoms this year – Not Going Out and Miranda being 2 of the most popular – but the best will undoubtedly be the Christmas edition of Vic and Bob’s House of Fools. As with anything Vic and Bob-related, the House of Fools Christmas special promises to be ridiculously bizarre. The plot follows the pair as they prepare to celebrate Christmas with neighbours Beef and Julie, housemate Bosh and Bob’s Norwegian son Erik. Unfortunately, circumstances lead to Erik’s present being burnt to a crisp, and a trip to replace it leads to a journey to Phil Collins’ mansion. There are no clips available yet, but the one above should give should you some idea what to expect. When is it on? 28th December at 10pm. Harry Hill stars in this zany comedy about an eccentric professor, based on the books by Norman Hunter and adapted for TV by Charlie Higson of The Fast Show. Branestawm and his niece Connie use science (although probably not in the same way that Walt and Jesse from Breaking Bad use science…) to try and save their village from an evil councillor and a businessman, who plan to build a munitions factory and oust the professor and his crazy inventions for good. Like sprouts and granny enjoying that bottle of brandy a little too much, an annual adaptation of a David Walliams children’s book has become something of a Christmas institution (for some people, at least). This year’s effort is an adaptation of Walliams’ The Boy in the Dress, which follows a young boy who enjoys wearing dresses and wants to break into the fashion industry. The cast includes Billy Kennedy, David Walliams (unsurprisingly), James Buckley, Jennifer Saunders and Kate Moss in a cameo. 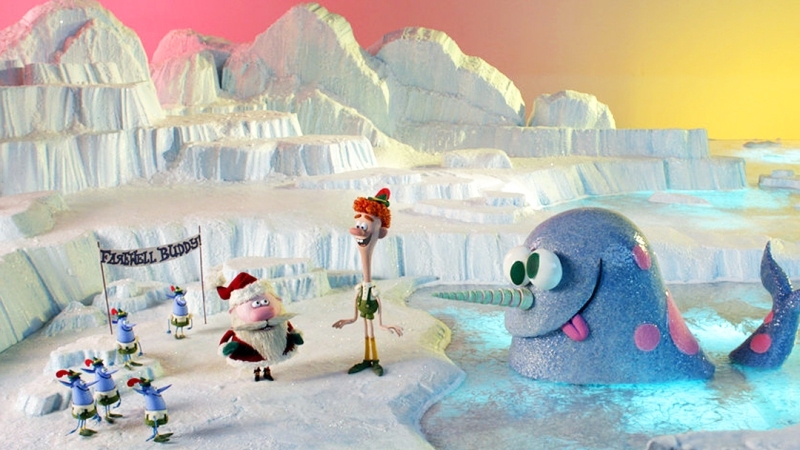 Buddy’s Musical Christmas is a remake that combines the now-legendary Christmas movie and the Broadway musical it spawned into one hour of stop-motion lovliness. You’ll be familiar with the story, although it’s such a good one that you won’t really care. Plus it now has very catchy songs. Jim Parsons (Sheldon from The Big Bang Theory) replaces Will Ferrell as the voice of Buddy, while Mark Hammill (AKA Luke Skywalker!) voices his long-lost father (yet never capitalises on the chance to utter the immortal line his evil on-screen father used). What would Christmas be without a Doctor Who special? Traditionally, Who Christmas specials are fairly silly and this year’s sounds no different, with the Doctor and his companion Clara teaming up with Father Christmas (played by Nick Frost) to battle an army of evil aliens. Yes, really. Check out the trailer; words don’t really do it justice. When is it on? Christmas Day, 6.15pm. When is it on? Christmas Day, 3pm. If none of those tickle your fancy, check out our all-time favourite Christmas TV specials – there are some real classics in there! ← What Series Should You Watch Next?